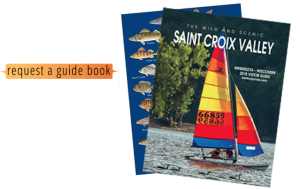 The Saint Croix National Scenic Riverway is a federally protected system of riverways located in eastern Minnesota and northwestern Wisconsin and includes both the St. Croix and Namekagon rivers offering 255 miles of clean water gliding and rushing through pristine landscape. One of the most peaceful ways to experience Minnesota and Wisconsin’s fall color show is paddling a canoe or kayak between the densely wooded banks of the St. Croix or Namekagon rivers. Much of the 164-mile St. Croix River forms the border between Minnesota and Wisconsin, and it was one of only eight waterways originally designated as a “National Wild and Scenic River” by the federal government, in 1968. It’s common to see eagles, herons and dozens of other bird species, and with a little luck and attentiveness, you might see mink, beaver, whitetail deer, fox, and maybe even black bear.